Our free Friday Night Lights ride on Friday, June 27, with riders meeting up at 8:30pm, will take guests out on the town to explore the night life in Windsor. The catch: since it’s a night ride you’ll need lights on your bike and the more lights the better! All you’ll need is a bike light to make yourself seen at night. If you don’t have any lights for your bike, we’ll also have bikes available for rent with special lighting to light up the night with designs and colours to make every passerby turn and see. 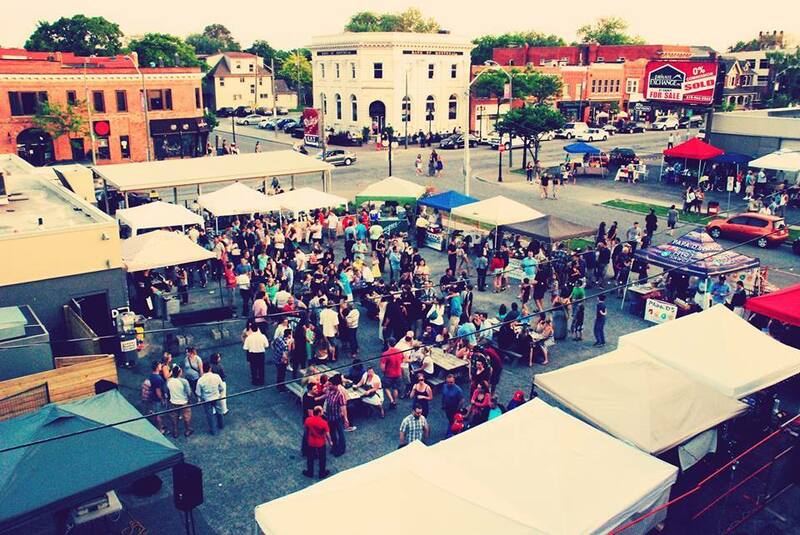 Our starting point for the June 27 Friday Night Lights will be the Walkerville Night Market. Due to the late night nature of the ride, the stops will be 19+ years of age. We’ll also be celebrating our very own Pina’s birthday on the ride. It’s going to be a blast! Since it is the starting and ending point of the free Friday Night Lights bike ride, you might as well arrive early and take advantage of the Walkerville Night Market on Friday, June 27. The Night Market is a community market promoting the hip and historic Walkerville neighbourhood, bringing people together with local business, musicians and artists. The Walkerville Night Market will be located in the popular, The Willistead Restaurant parking lot and includes vendors like Robbie’s Gourmet Sausage Co., Brandner Farms and others. It’s the Downtown Windsor Farmers Markets‘ annual Bike Day on Saturday, June 28 with special vendors and special bike related events! WindsorEats will be there, too! There will be bike tours departing from the market and bike rentals available. Prizes will be given to the best dressed cyclist. 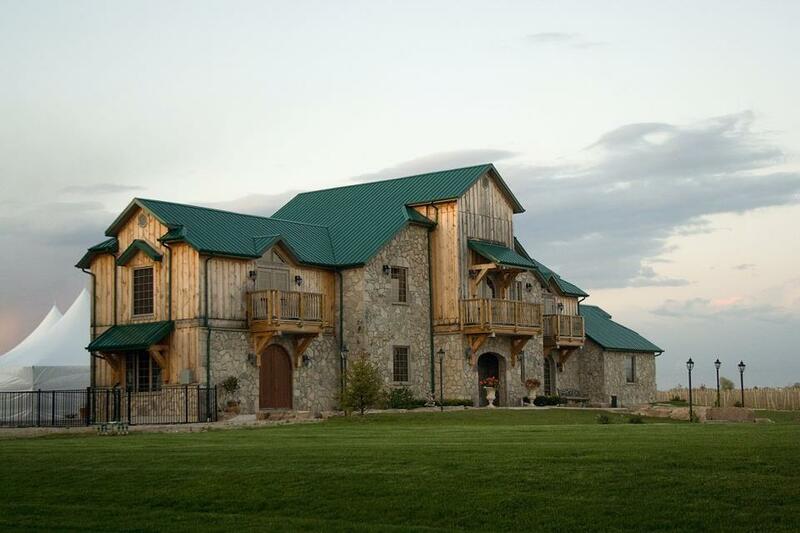 While you’re there, be sure to purchase a bottle of wine from Cooper’s Hawk Vineyard. This summer WindsorEats will be offering bicycles for rent at North 42 Degrees Estate Winery and Serenity Lavender Farm, located at 130 Cty Rd 50 East, in Colchester, offering the chance to cycle along Lake Erie’s north shore every Saturday on self-guided tours. Leave your car at North 42 Degrees Estate Winery, rent a bicycle and ride along the shore. We’ll provide you with a map and suggestions for unique points of interest along the way. Cycle the shore! It’s really the best way to enjoy our region. Our hybrid cruisers are the perfect way to explore County Road 50, the surrounding wineries, the Lake Erie shore, and all the great activities taking place along it. Each bicycle has a basket in the front to make it easier to carry your local purchases. The best part of the self-guided tours? You can also rent a Picnic in a Backpack! Let us prepare a few tasty treats for you to take on your adventure. 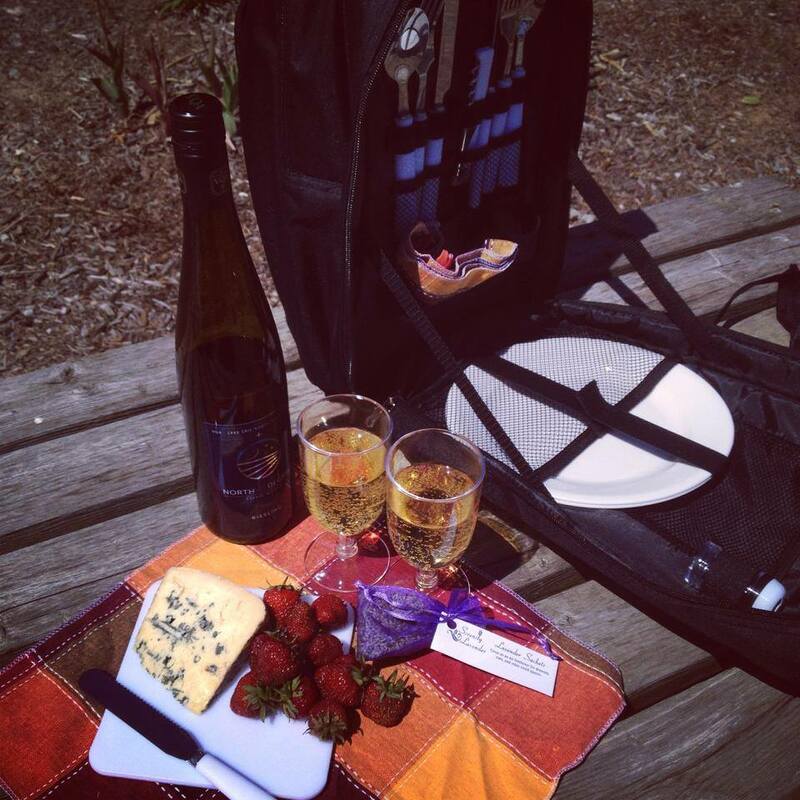 Each insulated pack includes local, seasonal fruit, artisanal Ontario cheeses, fresh bread, homemade preserve, a Serenity Lavender sachet, as well as plates, cutlery and cups for two. Everything you need to enjoy a nibble on your route all packed into a stylish and super cute pack! North 42 will gladly recommend the perfect wine to pair with your snacks. Plan ahead and reserve a bicycle before you head out. Visit Sprucewood Shores every Sunday to enjoy live entertainment on the lawn overlooking beautiful Lake Erie. Enjoy delicious food prepared by a different chef every week from 1:00pm to 4:00pm. Sip on a glass of wine or our signature sangrias with our delicious picnic basket lunches, and soak in the music and lakefront view. Every Wednesday and Thursday, Brandner Farms is now offering English horseback riding lessons. If you are 5 or older, have a passion to hop on a beautiful, calm, and quiet horse, you have found the right place. They are accepting applications for several students this year. Lesson days are Wednesday and Thursday afternoons. Some morning lessons will be made available upon request. Please contact Rachel Brandner for more info at 519-819-3868. On July 3, sample Oliva Melanio Torpedo, Oliva Melanio Torpedo Maduro and Oliva Melanio Maduro Robusto cigars at The City Grill during their Burn event. The evening begins at 6:30pm and costs $100, which includes the 3 cigars, two drink tickets and hors d’ouevres. Join Williams Food Equipment and WindsorEats on July 4, 2014, for an evening of fun with celebrity chef, Bob Blumer, “The Surreal Gourmet”. 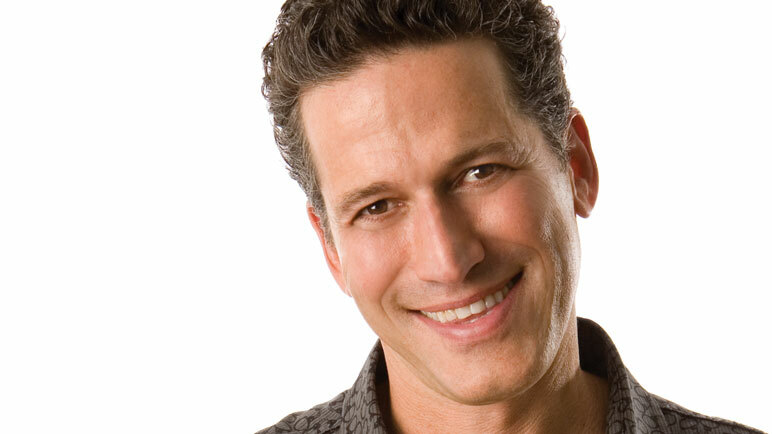 Gastronaut, artist and seven time Guiness World Record holder Bob Blumer is the creator and host of the television series Surreal Gourmet, and Glutton for Punishment, and host of World’s Weirdest Restaurants. Blumer transforms ordinary ingredients into wow-inspiring dishes through simple cooking methods and whimsical presentations that have become his culinary trademark. He is the author of five acclaimed cookbooks and is co-author of the best-selling Pizza on the Grill (just released in it’s second edition). There are just a handful of tickets left so get them quickly. The cost is $150 per person. Click here for more info and to view the menu. On Saturday, July 5, our Drinks of Walkerville walking tour will celebrate what is unique and exceptional about where we live. Windsor has a vibrant and colourful history along an international border that many have no knowledge of. With a resurgence of interest in the Canadian Club brand through hit television programs Mad Men and Boardwalk Empire, guests can learn all about a history of smuggling and gangsters during prohibition from a uniquely Canadian perspective. Guests jaunt through historic Old Walkerville, the town that Canadian Club built, and learn about its architecture as well as some well known and not so well known tales and folklore associated with the neighbourhood, including its rich rum running history and visits by Al Capone. You can even touch a bullet hole purported to have been shot by Al himself. You’ll walk through the hallways of the Canadian Club Brand Centre, home of Canadian Club whiskey, which was made popular again through acclaimed television programs Mad Men and Boardwalk Empire,and be brought through the history and brewing process of Walkerville Brewery. All this before finishing off the tour discovering the street art at The Willistead Restaurant. The Walkerville Art Walk & Rock is taking place during the Drinks of Walkerville tour as well so you can come before or stay after to keep the festivities going!